No, Sugar is not Paleo! Sugar is the generalized name for a sweet: a simple, edible, crystalline or granular form of carbohydrate that comes in different types. Most sugars are refined and to be able to reach the refined phase, they undergo several chemical processes. There are two types of sugar: monosaccharide, the simple sugar and disaccharide, the compound one. Glucose is a monosaccharide that occurs naturally in fruits and plant juices. Glucose is the foundation of most carbohydrates as it is often combined to form compound sugars such as sucrose and lactose. Glucose syrup is a liquid form of glucose which is widely used in food manufacturing. Fructose or fruit sugar occurs naturally in fruits, some root vegetables and honey and is the sweetest of all sugars. It is hardly absorbed and digested by the liver. In the form of corn syrup and some fruits, fructose can cause bloating and diarrhea. Fructose is said to raise insulin less than glucose. Sucrose or table sugar is a disaccharide comprised of 1:1 ratio of glucose and fructose. It is also found in fruits and other plants. 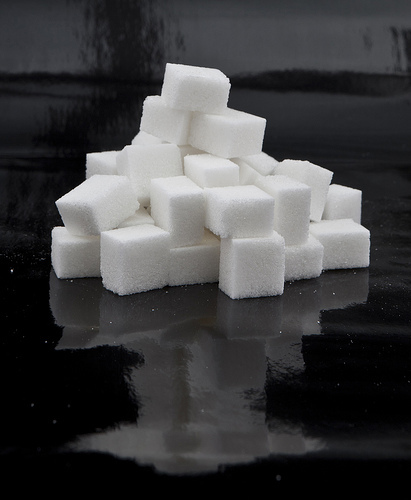 Sugar cane and sugar beets are the most popular sources of sucrose. In Paleo, only raw and natural forms of sugar are acceptable in moderate consumption. If we speak natural, this means that the sugar is in its natural form like maple syrup, organic stevia (the one that is extracted from stevia leaves) and honey. All other sugars which are processed are not considered Paleo. However, sugar that comes from fresh fruits known as fructose is acceptable in the Paleo diet. But it is recommended to eat in moderation those high-sugar fruits such as grapes, bananas, mangos, and cherries. Refined sugar is not Paleo because it wreaks havoc with your blood sugar levels, undergoes a lot of processing, and doesn’t have much to offer your body in terms of nutrition. Refined sugars which are highly available in the supermarkets today are not used in any way in the Paleo diet. They may be linked directly to the development and growth of cancer cells in the body. Regular white cane sugar and its derivatives (brown or cane sugar) are not Paleo. Although the cane plant is found in nature and is used to make sugar, the process it undergoes before it becomes edible crystals included chemicals and is processed in high temperature. They have extremely high score on the glycemic index that causes disorder on your blood sugar levels leading to insulin resistance and other conditions. Coconut sugar is neither Paleo. It is produced from the sap of cut coconut flower buds. To produce the commercial coconut sugar, the raw sap is reduced by heating. Carbohydrates in refined coconut sugar are very high at 92%. The main sugar found in coconut is fructose (the sweetest of all sugars). Why Get Rid Of Sugar? Though sugar provides an important role in providing food energy to human, there are lots of reasons why we should avoid it. First, too much sugar will spike your blood sugar, which prevents the body from burning fat efficiently. It stimulates a physiological stressor-reaction cascade that provokes adrenaline and cortisol release and thickens the blood. Second, sugar is harmful because as it enters the bloodstream, insulin is secreted. The more sugar consumed, the higher insulin is secreted. And higher sugar diet can lead to insulin resistance which is the beginning of obesity. Third, Sugar has addictive properties complete with a serotonin rise and crash as well as some bizarre withdrawal symptoms. And the addictive properties of sugar are well documented. One you consume too much sugar, you are more likely to experience hypoglycaemia or “sugar crash”, leaving your body craving for more sugar. Lastly, sugars are building blocks of carbohydrates. They come in many forms and each of these leaves a certain amount of damage and destruction in the human body. They do not contain any nutrients at all and is associated with serious illnesses such as diabetes, heart disease, obesity and autoimmune diseases. Click here to see what other sweeteners are Paleo. What experts say about Sugar.. Is it Paleo? Chrs Kresser. Let’s Take Back Your Health. Is Refined Sugar Really Toxic? The Paleo Diet. Sugar is Killing Us.